The new Boeing 747-8. I think I finally met the match for the B-377 Stratocruiser of the 1950s. Have a look at the future! Wonder how large the cabin crew will be on this "heavenly hotel?" The entry-way reminds me of boarding the QE-II to sail to London in the late 1980s. Thanks to Fay Kulenkamp, retired F/A, MSP, for forwarding this. Now I will go back to working on an event to be held at the NWA History Centre on August 6, 2011, 1-3 p.m., which honors the NWA Orient Route Pioneers; flying the (fantastic for its time) DC-4, MSP to Tokyo - a 33-hour flight with at least two crew layovers. $5.00 per person donation to attend the event. E-mail Mary Fryer, mcfryer@q.com to reserve your space. More on this in a later post. Nancy Rogers working the glamorous "4" on a MSP- Chicago Midway flight in 1957. 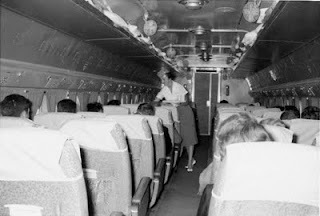 Note the A/C system (small fans mounted to the overhead racks. DC-4 to B-747-8 all in one blog post. We've come a long way, baby! Good to have the blog being promoted to more people.